When we moved into our house and needed all new furniture, we immediately went to our local Raymour and Flanigan and spent a few hours there and worked on furnishing our entire house, so when it came time to re-design our family room and make it more “baby-friendly” , I knew right away that we’d go back to Raymour. We decided to keep our existing couch since we love it, and after 5 years, it still is in perfect condition, but we needed to update/replace the other pieces in the room. I want to thank Raymour & Flanigan for partnering to re-create this space! First I went online to get an idea of what pieces I wanted for the room, then the next day I visited the store to look at things in person and make my final selections. I worked with the manager there and it was so much fun and easy to browse their selection and finalize exactly what I needed. The showroom is setup in a way that you can really get an idea what a complete room would look like in your home. I liked picking pieces from different collections, but if you’re someone who needs a little help, you can choose to buy the compete collection and decor from their setup, and call it a day! Our family room has a large mantle with a TV above, so I knew I wanted 2 large console cabinets to go beside it, to finish the look, while also giving us adequate storage for all of Calista’s new toys and accessories. The Casa Bella console’s that I chose are absolutely gorgeous, yet so functional and reasonably priced. Sometimes you can’t get that high-end look and quality within your budget, so I was so pleased to find these. Because the walls above are so high I wanted something to fill the space and these gorgeous arch mirrors were just the thing! I went with this large grey-wood coffee table which has drawers that open on both sides, which is perfect for remotes, books, and more! 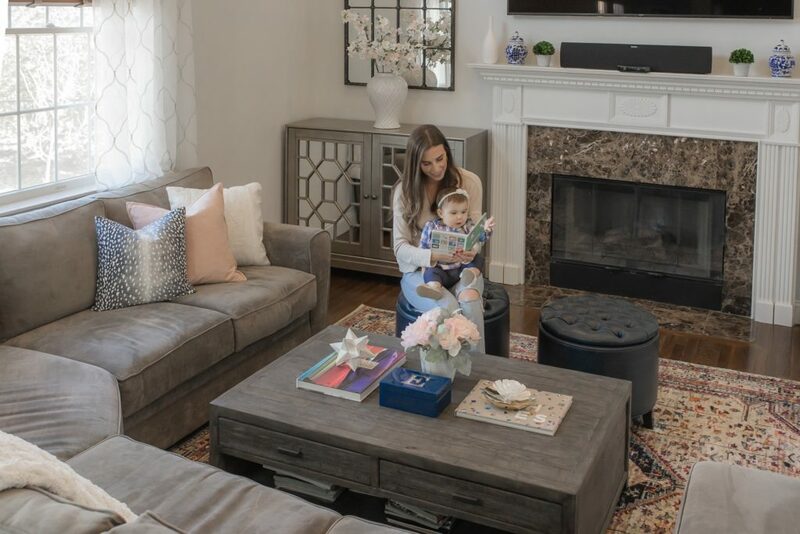 The 2 navy leather ottomans were a great addition to the room for additional seating or foot rests, and are perfect for storing blankets and stuffed animals. Lastly, I chose the white and silver nested console tables for behind the couch to finish. I was so happy with the way the room came out, and love how much storage it provides! It’s not easy to have a pretty space when you have an overwhelming amount of baby accessories, but I really feel like we accomplished it with Raymour! Thank you to Raymour & Flanigan for providing the products for this space. All expressed opinions are 100% my own. This post contains affiliate links, which make this blog possible.